As we like to say, youth is not a number, it is a state of mind! AIM YP does not have established age guidelines or limitations. However, our programming is most relevant to young business professionals between 21 and 4​5 years of age. Not necessarily. ​​​You can live, work, or have gone to school in Dearborn County. If you haven't done any of that, but just want to network with our young professionals you are certainly welcome. We want to be inclusive, not exclusive. 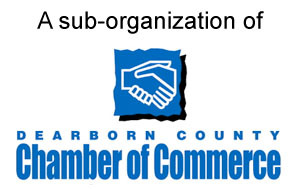 Annual membership dues are $25 per person for employees of a business that is a member of the Dearborn County Chamber of Commerce. Employees of non-chamber member business can join for $35 annually. Chamber members can purchase a one-year membership on this website's Become a Member page. You can also pay in-person by cash or check at most AIM YP events. You'll find a calendar of upcoming events here.